Q: What is a scaphoid fracture? A: The scaphoid bone is one of eight small bones that make up the “carpal bones” of the wrist. 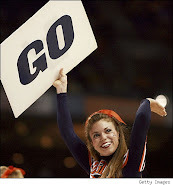 There are two rows of bones, one closer to the forearm (proximal row) and the other closer to the hand (distal row). 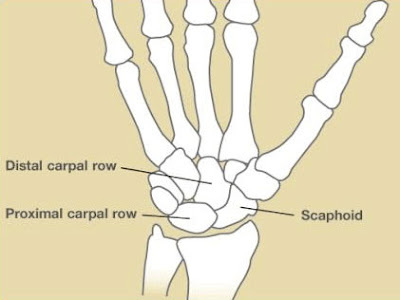 The scaphoid bone is unique in that it spans the two rows (see Figure 1). This puts it at extra risk during injury, which accounts for it being the most commonly fractured carpal bone by far. Q: How do scaphoid fractures occur? A: Fracture of the scaphoid bone occurs most frequently from a fall onto the outstretched hand. Typically there is pain initially, but the pain may decrease after days or weeks. Bruising is rare, and swelling may be minimal. .
Q: How does one diagnose a scaphoid fractures? 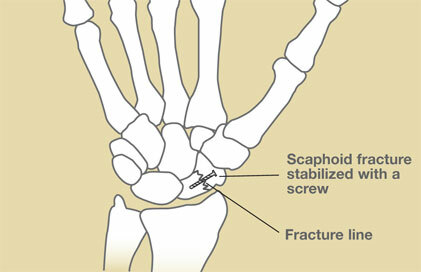 Q: How does one treat said scaphoid fracture? A: If the fracture is non-displaced, it could be treated by immobilization in a cast. The cast usually covers the forearm, hand, and thumb, and sometimes includes the elbow for the first phase of immobilization. Although the fracture may heal in as little as 6 weeks, the healing can often be delayed due to poor blood supply in the area. With surgery, a screw or pins are inserted to stabilize the fracture, often with a bone graft to help heal the bone (see Figure 2). Sometimes screw fixation surgery is recommended—even in non-displaced cases—so as to avoid prolonged casting.